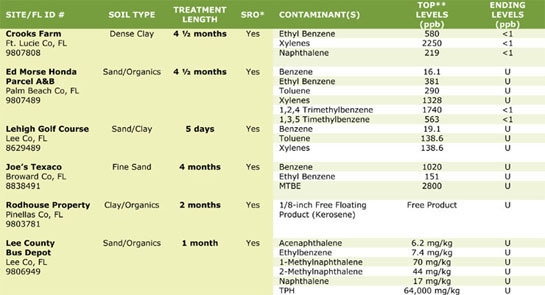 Biovation provides unprecedented cleanup results with our revolutionary bioremediation methods. We have a proven record of SUCCESSFUL SITE CLEAN-UPS—many resulting in Site Rehabilition Completion Order (SRCO). Our methods deliver results—typically in 5 MONTHS* or less. * Denotes cleanup time from treatment start date to Groundwater Cleanup Target Levels (GCTL). Typical site cleanup routinely takes 5 months or less, unique site conditions may take longer. Does not include SAR, RAP, or SRCO approvals. * SRO-Site Rehabilitation Order issued by the FDEP following 1 yr. verification sampling. ** All sites were treated in-situ with the highest contaminated monitoring well reported. † FL ID-Site identification number assigned and results verified by the FDEP. Learn more about our Project Overviews and find answers to Frequently Asked Questions.